Many boats use masthead-mounted anchor lights, but some may still be using the older Guest anchor light (pictured above) that hangs in the rigging. While the Guest lights don’t exude the charm and tradition of a paraffin lantern, they have the advantage of being seen more easily than masthead lights, which tend to blend in with a starry sky or tower high above a boat powering nearby, and the large 6v battery will last for a couple hundred hours. The standard incandescent bulbs, however, leave a little to be desired in terms of luminosity. Good news: There is an affordable LED replacement that not only burns longer with less energy but also burns brighter than the incandescent. I purchased and installed one prior to our month-long summer cruise, and it worked well. It was much easier to spot from shore in a crowded anchorage than the old incandescent, and it burns as bright as many masthead lights. There may be other suppliers out there, but I purchased mine for 6.95 + shipping from eLite, part T3-1/4 (10mm) Miniature Bayonet (BA9s) Base LED Bulb. The company responded promptly to my order, notifying me of invoice receipt and shipment date. The bulb arrived quickly and well packaged. Time will tell just how long the bulb will last, but we spent some 25 nights at anchor already this summer. Simplicity and technology need not be at odds with each other. Take the technology of Dacron or fiberglass. Both of those bits of technology have proven simple and yet remarkably durable and efficient, making owning, sailing, and maintaining a boat simpler – and more enjoyable – than ever. Now, if cotton and oakum are your thing, read no further. When roller furling emerged on the market, traditionalists viewed it with skepticism, and for good reason. After all, why complicate things? And early furling systems did have their problems. Not only were they bulky and expensive, but they often jammed at the worst possible moment, leaving skippers to watch helplessly as their headsail flogged itself to pieces or, worse, drew greedy gulps of wind as the boat thundered out of control toward another boat, or a dock, or…. Modern furling units have resolved most of those issues and are much more reliable. There are a number of roller furling units on the market, a few of which have received excellent reviews and some that have not; some are well-known and others unfamiliar. Finding the right combination of quality without publicity could translate to major savings on a great product. One of those lesser-known but quality units is Spin-Tec. We met Betsy, a Spin-Tec representative, at the Strictly Sail show in Chicago last year where she demonstrated the Triumph 2000 system and discussed with us its features and construction. We were immediately drawn to the simplicity of the design. Unlike most roller furlers, Spin-Tec furlers do not use ball bearings. Instead, the unit – drum and foil – rides on Delrin bushings. 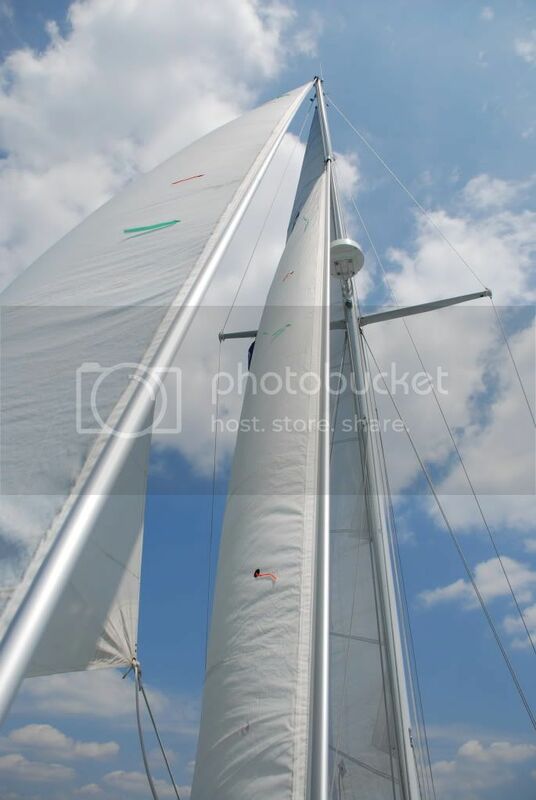 Additionally, the unit does not utilize an upper swivel between the headsail halyard and the head of the sail, meaning that the whole thing rotates as a unit so there are fewer parts to wear out and less likelihood of failure. This design eliminates the weak spot of traditional roller furlers. 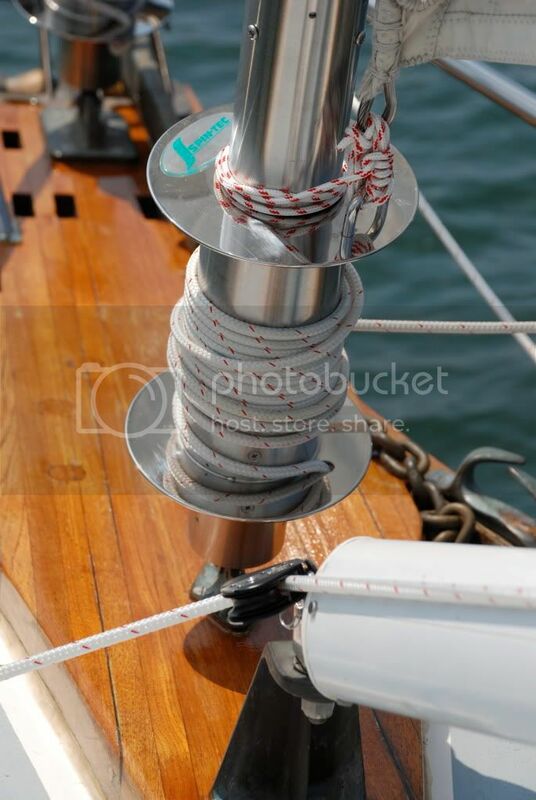 Upper swivels are not only subject to wear, but they can cause halyard wrap if the headsail halyard is not led to the furler at an appropriate angle. 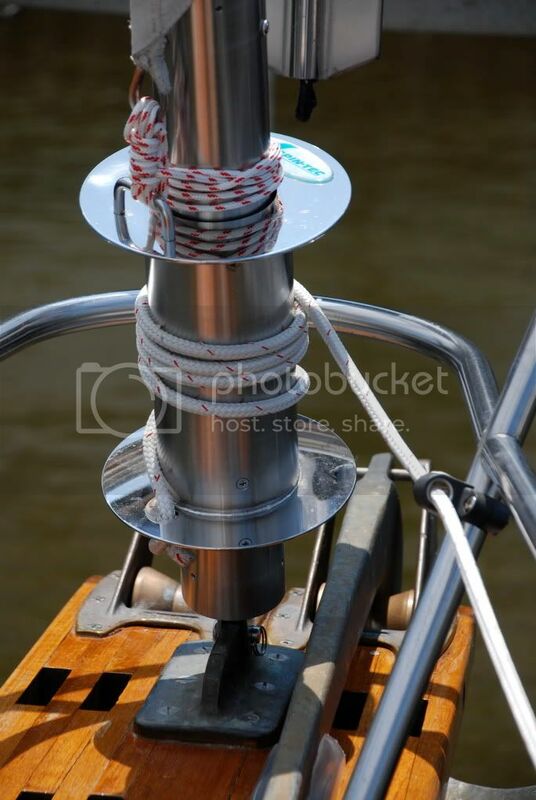 Typically, this involves adding hardware at the masthead to achieve a specified angle between the halyard and the furler. Halyard wrap renders a furling unit inoperable, and potentially at the worst time. Finding a unit that eliminated this problem was a priority. 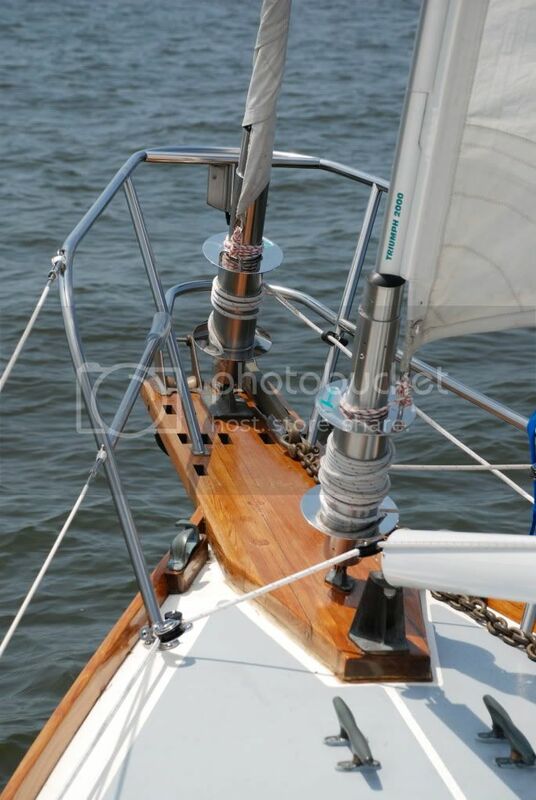 This design certainly is simpler than many of the units on the market, but it’s not without its complications, most notably the inability to hoist or remove a headsail without going aloft to secure the head to a stainless steel bail that is welded to the upper part of the extrusion, or masthead tube. To address this, Spin-Tec sells a device, a sort of car-assembly, called a halyard accessory that rides on the foil and allows users to change sails from the deck with the aid of the halyard. The unit certainly seems handy, and functioned well in Betsy’s demonstration, but the additional expense of $300 is tough to swallow, especially since we have no need to change the headsail and don’t mind a trip aloft. There is an additional drawback to the halyard accessory: It uses a meathook-shaped piece of stainless steel to hook the bail on the masthead tube, thus securing the head of the jib. Imagining that pointy piece of steel aloft immediately conjured visions of a shredded drifter. The standard roller furling assembly is still a slick, streamlined unit, and the fact that it came with everything needed for setup was equally attractive. When we looked at comparable units by other manufacturers, the advertised price was only the starting point. And not only were their starting prices higher, but the necessary add-ons meant that we would get a lot less bang for our buck. Like most sailors, we are price-conscious and must spread our boat units as far as possible without compromising quality. Spin-Tec’s quality and pricing meant that we were able to buy two furlers – staysail and jib – for only a little more than the price of one furler by big-name companies like Schaefer (which was second on our list) or Harken. Spin-Tec furlers differ from other furlers in their assembly. Rather than rivets to secure foil sections, Spin-Tec includes aluminum channel inserts that are glued in place to join foil sections seamlessly. The theory behind this is that the entire furler is in compression when in use so there is no need for fasteners. This certainly speeds and eases assembly, and seems plenty stout, but only time will tell how well the system will hold up. I should add that the aluminum channel inserts fit snugly within the extrusion, so the glue is mostly redundant and a gap-filler to ensure a snug fit. The unit is also designed to fit over existing fittings, so there is no need to cut or modify the rigging. Simply remove the turnbuckle from the lower swage fitting and begin sliding foil sections toward the upper swage fitting, joining sections as you go. During assembly, five Delrin bushings are inserted at regular intervals in each foil section to secure the furler to the headstay, ensure smooth operation, and eliminate metal-on-metal contact. Spin-Tec includes a steel rod that is used to push each bushing to its proper location within the foil. This process involved quite a bit of grunting and resulted in a couple of blisters. The instructions suggest that moderate force may be required to push each bushing to its seat – i.e., projections within the extrusion. Either “moderate force” is an understatement or I’m a total wuss. Yes, there were some bushings that went into place with “moderate force,” but that was the exception and not the rule. Most bushings required a fair bit of coaxing, which occasionally involved a few taps with a hammer. The upshot of all that effort is that it’s unlikely the bushings will ever shift out of position. I completed assembly of both furlers over a two-day period, totaling about six hours. This system is the only system I’ve assembled, so I can’t make any comparisons to other brands. The assembly did catch the attention of the harbor master and a few boat owners. The harbor master commented on the size (diameter) of the foil sections and the lack of rivets, shrugged his shoulders and left. The double-grooved foil, shaped like an airfoil, is elliptical and slightly larger than most. Adjusting headstay tension once the furler is in place is accomplished easily. The drum assembly of the furler slides over the extrusion and the lower tube, and is secured with six machine screws. Accessing the turnbuckle requires removing the six screws and sliding the drum up the extrusion where it can be locked in place. With the drum out of the way, the turnbuckle is adjusted easily. The furler’s open-drum design is simplicity itself, and good lead placement results in a smooth, tight coil of line. This is another feature that sets Spin-Tec furlers apart from other brands that use closed or semi-closed drums that can make clearing furling line jams impossible or, at best, frustrating and time consuming. Because the Spin-Tec drum is open, however, some tension needs to be kept on the furling line when the sail is unfurled lest the line work its way off of the drum. Simply cleating the furling line prevents this from happening. We installed a genoa track-mounted jam cleat for each furling line on the starboard side and another, mounted to port, for the staysail outhaul since it’s set on a boom. The kit included four fairleads, which was not enough for Ariel’s length. Betsy from Spin-Tec happily sent us four additional fairleads that I placed in strategic locations to minimize chafe and provide smooth operation of the furling line, 60′ of 7/16″ double-braid nylon that comes with the kit and is easy on the hands. Rigging the furling unit for the staysail was only slightly more involved than the jib. Beyond the standard assembly and furling line routing, we needed to rig an outhaul that would allow us to maintain the boom-mounted staysail’s self-tending feature. 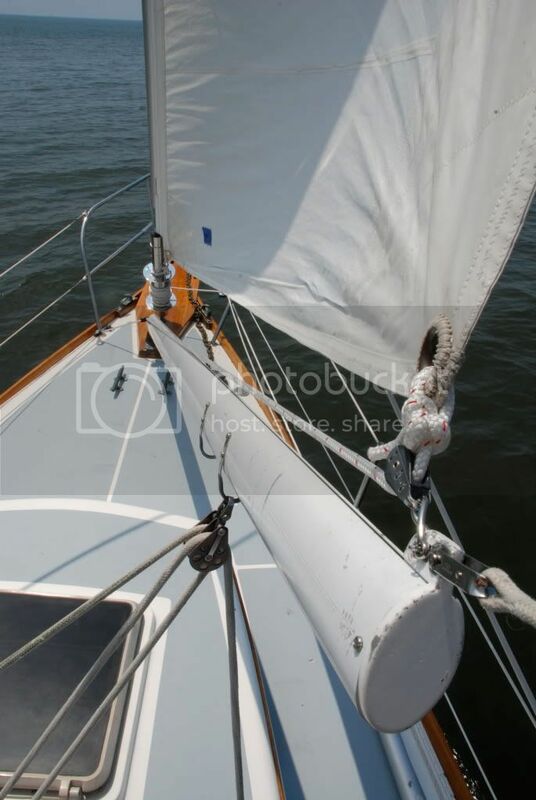 We already had a block on the aft end of the staysail boom for an adjustable outhaul that would redirect the line forward toward the staysail boom pedestal. From there, I added a small block to the staysail gooseneck and routed the outhaul outboard to the rail-mounted block included in the Spin-Tec kit. The staysail outhaul then travels aft through standard fairleads where it terminates at a jam cleat mounted on the genoa track. Unfurling the staysail requires uncleating the line to the furling drum, then hauling in on the outhaul. Furling the staysail is just a reversal of these steps, the staysail boom topping lift keeping the boom under control when the sail is furled. This setup has the added benefit of making it possible to adjust staysail outhaul tension from the cockpit.